Being a young boy growing up in the shadow of World War II and Korea, it was always cool listening to the older males within the family, or those that I encountered in everyday life, spin their war stories. These were the days before Vietnam became daily headlines in the evening news. In fact, the Korean War was well on it’s way to being largely “the forgotten war”. One of my favorite storytellers was good old Uncle Fred. Well… he wasn’t truly a relative. He was one of those quasi-relatives; in the family so long and so visible in my life that he simply was appointed “uncle” as a matter of respect. More like a brevet uncle. His wife, Aunt Pearl, (her “aunt” status also a bestowed title) was a high school buddy with my mother. Anyway, Uncle Fred was a somewhat lanky and tall fellow, and had a kind of slower way to his physical movements, and he had a great but somewhat dry sense of humor. Like most young boys of that era I enjoyed anything military and being a growing history buff I particularly was interested in WW2, which had basically just ended 10 years prior (at the time I reached five years old). Obviously every adult person of authority in my life at that time had war experiences either in combat or on the home front; I was the spawn of the Greatest Generation… and the vanguard of the Boomer Generation. Anyway, Uncle Fred had served in the Army Air Corps during the war and went on to retire from the evolved U.S. Air Force in the mid 60’s. So not only was he a combat veteran he was also active military and still wore the uniform. In those very early days I had only met him and Aunt Pearl a couple times because him being active duty having had a few duty stations that took him and his family away for long periods. He especially spent a long stint in Hawaii and I recall seeing him like once a year in those days. It wasn’t until he became assigned more local to Chicago that we saw him with any regularity and I was about 10-12 years old; well into understanding the war and deeply into the war interest. In the occassional family get-togethers, parties, picnics, etc., and when he had a couple drinks, he would tell a few of his stories. You know how the men at parties tended to separate from the women folk… drinking and telling their yarns.. and I loved to hang with them to hear the occassional forbidden swear words and jokes about women that I didn’t really understand totally. Other men at those parties would naturally gravitate the conversation to military things given Uncle Fred was active duty. Then invariably the war reflection talk would start. He would tell stories of his B-17 bombing missions… captivating me with his recountings of German ME-109‘s attacking the formations… his plane being shot up (“You mean, you actually got shot at, Uncle Fred??”). He’d say, “Yup.. they flew so close you could wave at them in their cockpits.”, he would say. “Did you wave at any?”, I would ask, thinking that made some difference in life. “Hell no! I was too busy flying the plane and the crew was too busy shootin’ at em!” He told me the scariest thing he had ever seen in his life (and I was way too young at the time to appreciate his observation about that)… “…was when those damn 109’s would fly right at the nose of our B-17 and as they fired their machine guns they would put their plane in a spin so as to spread the firing shots in a greater area.” He would use his hands to demonstrate how this occured and I watched him.. hypnotized by his words. “Did you shoot down any Germans?”, I would ask. “Not me, I was too busy flyin’ the plane. Sometimes the other gunners would flame a Kraut or two though.” Yeah.. Germans were “krauts”… just like in the “real” movies. The other males in our little party group would take all that talk in stride and grab another drink. In between Uncle Fred’s war stories, and since I was generally the youngest there, the other men of the “tribe” occassionally shared their own insites about remembering when they were young and went to school during the Depression… and where they were when Pearl Harbor was attacked. It was always, “the damn Japs”. Anyway, as I grew up he was always a special Uncle.. and I was proud of the fact that I knew a guy who piloted B-17’s and bombed Germans during the war (I had playground bragging rights to “my uncle flew B-17’s during the war”) . When I was about 12-13 I recall we had taken a family trip to Ohio and because he was an officer Uncle Fred took us on base… he was an Ops Officer of some sort at Wright-Patterson AFB. I was totally awed. We even have some old photo of me in the control tower at Wright-Pat along side uniformed Uncle Fred. After that trip I decided if I were to serve in the military then I would enlist in the Air Force (which I did). Uncle Fred retired from the military in the mid 60’s and ended up trying to fit into a couple civilian jobs and coping with the wanderlust that many times becomes part of the lives of retired military. One job I recall was a private pilot-for-hire, another was a real estate agent. Fast forward a number of years. One of Uncle Fred’s & Aunt Pearl’s sons stood up at my wedding. Add another few years and my oldest son, then about 13 himself, was assigned a school assignment to interview a relative about a past experience. I immediately thought of Uncle Fred. By that time my own kids had an interest and enjoyed Uncle Fred & Aunt Pearl at family gatherings. So it was not difficult to get Uncle Fred to agree to be inteviewed by Steve for his school assignment. He also agreed that we could tape record the interview… as long as we edited out any expletives. We gathered at his home in a Chicago burb in his rec room. There were photos of planes and bombers.. and even a model B-17 on a shelf. He was obviously proud of his service as it became who he was. But what unfolded was an amazing story; something of which movies are made (and I am sorely tempted to this day to write a fictionalized story around his actual experiences). By the time war broke out Uncle Fred was already in the Army Air Corp, in his mid 20’s and in those days that was considered “old” for military service. For a while he did training of crews stateside. Then he got assigned a crew and a B-24 Liberator and orders for Italy. Uncle Fred was raised in the Wisconsin north woods town of Spooner, a rural small town that would ultimately become a fisherman’s haven for vacationing Chicagoans after the 1960’s to the present because it is smack in the middle of lake country. Apparently as part of a training/relocation flight that would have him end up in Italy via North Africa, he decided to buzz his home town to impress family and friends (there was no FAA in those days.. no formal flight plans… no flight paths; all seat-of-the-pants). 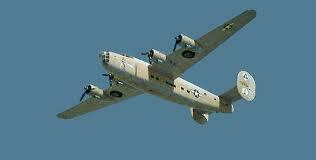 So he flew low down main street on two passes and it was reported the ground shook as the huge four engine bomber passed. He learned later that those two passes did more for the selling of war bonds for that county than anything done to date. 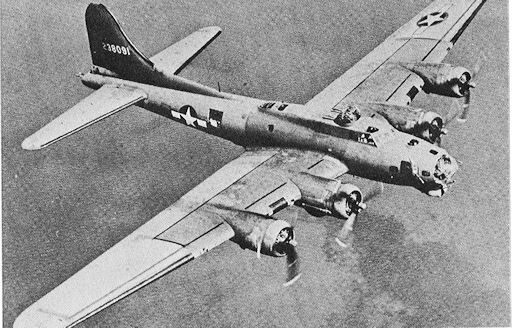 A B-17 Flying Fortress on a mission. His actual combat experiences in North Africa were minimal given by the time he had gotten there (June, 1944) the Germans had been defeated there. In the course of assignments Uncle Fred & crew were assigned to a B-17 and he took part in at least one of the Ploesti oil fields bombing raids that went from June to August, 1944 in Romania. He tells of the terror in seeing ahead of you the German flak explosions and you know you have to fly right into that to drop the bombs. He said the flak was so heavy.. and you could hear the shrapnel his the side of the plane. They got hit a couple times, stopping a couple engines; and they got hit in the nose… and the bombardier was dead. He ordered the crew to bail out. Uncle Fred told of what it was like floating to the ground… and seeing his aircraft bank to the right as it smoked to the gound and exploded. He seemed to find his crew when they landed… spread out in a clearing. They had bailed out over Yugoslavia… which was also embroiled in their own civil war while fighting the Germans. A partisan band found the downed flyers as a German patrol was nearing to check out the crash. Apparently a couple partisans delayed the Germans enough to allow the group to escape into the mountians. Uncle Fred said they seemed to have traveled about a month to and from various locations, evading both the Germans and Tito’s Communist Chitniks until they reached some mountain redoubt where they met other downed American flyers. 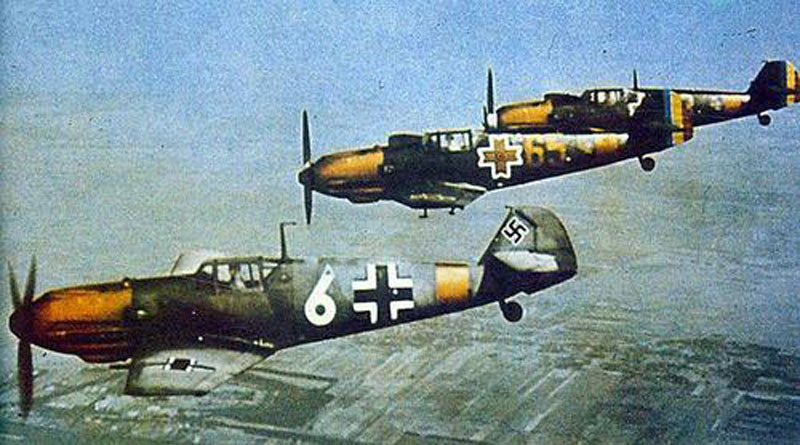 The partisans had gotten word back to the Allies of the downed flyers and that help was needed to repatriate them back to Allied lines. Apparently the Americans received word of the location of the airmen and plans were made to send in an aircraft to rescue them away. A makeshift airfield was made in a clearing.. and then the day came when a lone C-47 cargo plane landed. A crewmember opened the door to accept the couple aircrews… but as he opened the cargo door he saw nearly 1500 airmen running across the field toward him. It seems someone at some headquarters somewhere had presumed there were only Uncle Fred’s crew and another few crew members.. so they had sent one rescue plane. 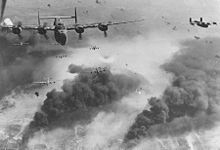 They weren’t prepared to accept 1500 airmen who were also shot down in the various raids (about 350 aircraft total were lost in all the Ploesti raids). The Allies had written them all off as lost or missing. Uncle Fred said that ultimately they were all rescued. Fast forward 40 years. Sometime in the 1980’s a local Chicago-based organization of Yugoslav patriots were having a re-union and had somehow gotten wind that Uncle Fred had served in Ploesti bombing raids and had bailed out and received assistance from a patriot group. He was asked to give a brief speech along with some other air veterans. He said when he had attended this event he had unexpectedly met some of the same fellows who had rescued him and his crew from the Germans. It was an amazing reunion, to say the least. The whole story was amazing. This entry was posted in Reflections On Those That Raised Us, Relatively Speaking and tagged Airforce, Army Air Corp, Fred, German, Korean War, Uncle Fred, Vietnam, World War II. Bookmark the permalink. Ha! Your father was there four years before me. Hey, your uncle who fought in Italy.. was he part of that Mountain Division that Dole served in? Are we talking The Devil’s Brigade here, chuq? They were also in Italy. Thanks for the link, Doug. To be appreciated rather than “liked”. The head on attacks he mentioned by 109’s were all too frequent; the nose was the most vulnerable spot on fortresses; which is why the “G” model with the chin turret was developed.